We didn't get Ally a Halloween costume, but that didn't stop us from Trick or Treating! Instead of going around the neighborhood to ask for candy, we joined the UNICEF Superhero campaign and asked for donations from Ally's lolos and lolas, and ninangs at the party we attended last Sunday. This was such a fun idea! 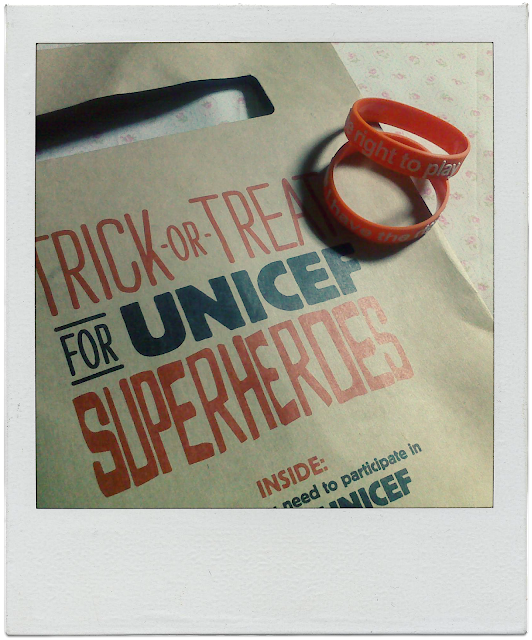 When we were at SM Megamall a few weeks ago, Ally's cousin Yapoy got this free kit from the UNICEF booth. The kit contained a Trick or Treat donation box, ballers that say "I have the right to play", a participation pin, and some forms. But since Yapoy is on vacation, the kit was passed on to Ally. The tradition of Trick-or-Treat for UNICEF began in 1950 in the United States, when Philadelphia schoolchildren first went door-to-door at Halloween collecting money in decorated milk cartons to help children in need around the world. They raised a grand total of $17, kicking off a campaign that has since brought in millions of dollars each year to help UNICEF provide medicine, better nutrition, safe water, education, emergency relief and other support to children in more than 150 countries. Millions of children now participate in Halloween-related fundraising campaigns in the United States, Canada and Hong Kong, China, among other places. In these campaigns, children go far beyond trick or treating in scary costumes with the familiar orange UNICEF collection boxes in hand. Children and young people take part in various fun and educational events that help them gain a better understanding of child rights and the challenges facing children around the world – including poverty, killer diseases and armed conflict. This global campaign, now in the Philippines, has raised more than $167 million around the world and remains an inspiration to the young (and the young at heart) to further the cause of children everywhere. We're turning in the donation box this week. Thank you lolos, lolas, and ninangs for your donation to UNICEF!